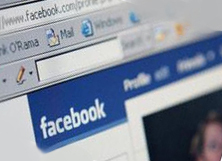 Facebook has turned out to be the most socialized place on the internet over last half a decade. Every keen user on Facebook has made it a trend to share every life events with their friends & community. 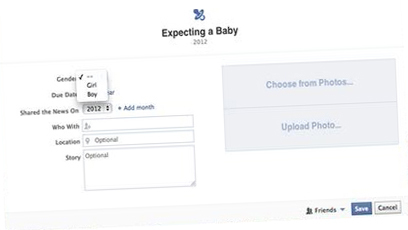 To this hype and hoopla, Facebook adds a new add-on to their timeline “expecting baby”. The main idea behind this is to give the users a unique experience and to help them share their personal life with their beloved friends and community with ease. According to this new add-on, like previously people could make announcements on the loss of loved ones, engagements, relationships, breakups, now expecting parents can also make this amazing declaration and share it with their friends. Go to your profile, then click on life even over the status box, you will see a drop-down menu, click on Family and relationships, then Expecting a baby. Fill your dialog box and save it. 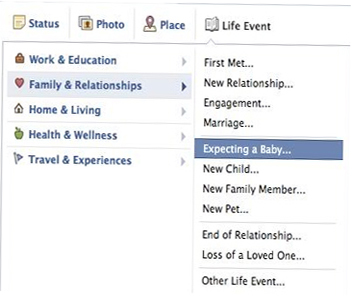 Will you be the one to share the news of the baby to come through this amazing new option of Facebook?